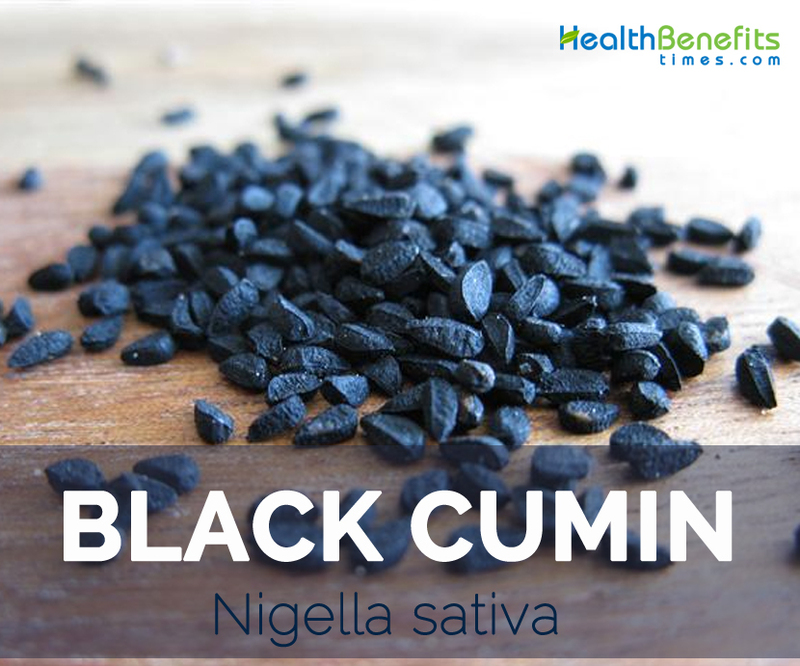 Nigella sativa also known as nigella or kalonji, often called black cumin, is an annual flowering plant in the family Ranunculaceae, native to south and southwest Asia. Black Cumin seed has been used in Middle Eastern folk medicine as a natural remedy for various diseases for over 2000 years. The prophet Mohammed is mentioned as saying in the Koran, “This black cumin is healing for all diseases except death.” The black cumin he was discussing to be Nigella sativa. It’s been used for centuries to treat everything from abscesses to herpes zoster. Due to its amazing power of healing, Black Cumin has got the place among the top ranked evidence based herbal medicines. 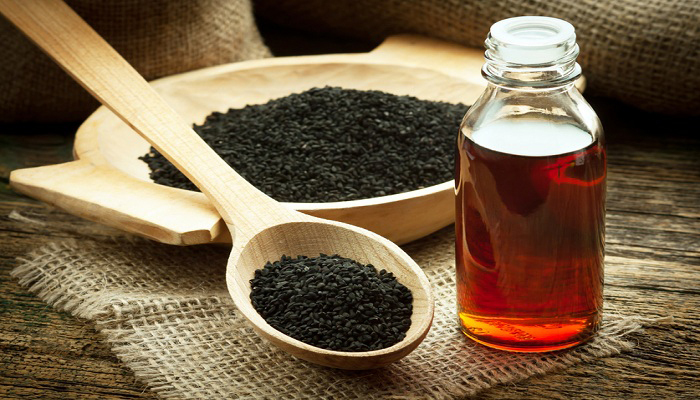 Most of the therapeutic properties of Black Cumin seed are due to the presence of Thymoquinone which is a major bio active component (30%-48%) of the essential oil. 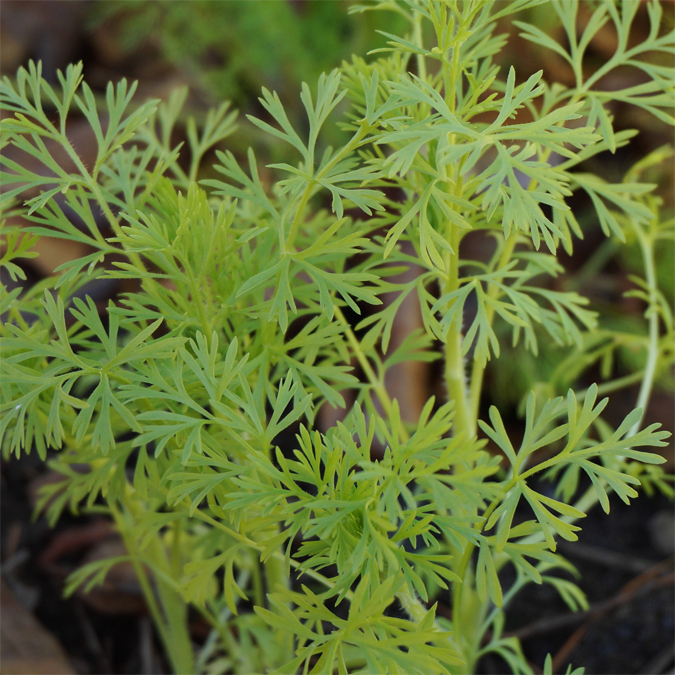 Black Caraway, Black Cumin, Black seed, Black Seed flower, Edible Love-In-A-Mist, Fennel-Flower Nigella, Fitches, Nutmeg Flower, Onion Seed and Roman Coriander are some of the popular common names of Black Cumin. 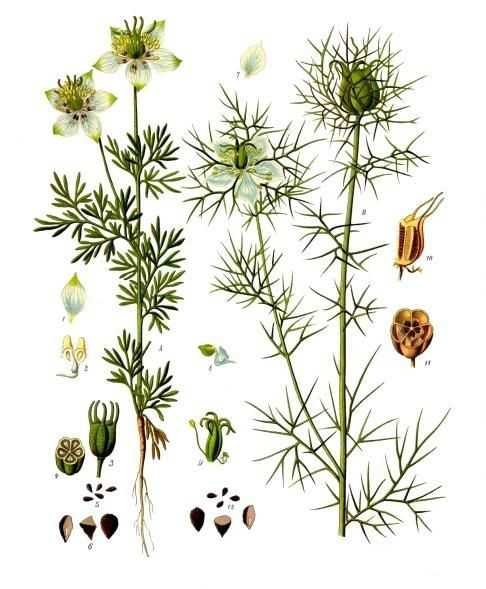 Black Cumin is an annual stout, erect, flowering herb, 30–50 cm tall and grows well in full sunlight and thrives well in wide range of well-drained soils, but prefers sandy loam soils. It is quite drought tolerant and can survive in dry soils but needs regular watering during prolonged dry periods. Plant have a well-developed tap root along with branched, sub terete, weakly ribbed, pubescent, dark green stem. Normally leaves are 7–5 cm, bi-pinnately, tripinnately to multi pinnately divided into thin sub linear, pilose lobes. The upper leaves and petiolate are long while the lower leaves are small. Flowers are terminal and solitary, actinomorphic, hermaphrodite, pentamerous, hypogynous on 4–11 mm minutely hairy and ribbed pedicels. Black Cumin plant offer inflated, ribbed, oblongoid, tuberculate capsule 6–16 mm × 5–12 mm, which is normally greyish-green while young and gradually turns to brown at maturity. These inflated capsule consists of numerous triquetrous to obpyramidal, rugose seeds that are white turning to black whenever exposed to air. Seeds normally have pungent bitter smell and have taste like a combination of onions, black pepper and oregano. Due to its distinctive smell and taste it has been used in several foods since ancient times. History of black cumin is unknown, most probably in southwestern Asia or southeastern Europe. Its seeds were found in the tomb of the pharaoh Tutankhamun in Egypt. During ancient times, Nigella was already cultivated by the Jews, Arabs and Indians. Later, it was introduced into several countries of Europe, Asia, and Africa. The species, previously cultivated in Central Europe too, has lost somewhat of its economic importance. But now it is cultivated throughout the world due to its nutritional value as well as unique taste. Apart from their taste like a combination of onions, black pepper and oregano, black cumin is a good source of nutrients and minerals. Consuming 100 gram of black cumin offers 8.53 mg of Manganese, 2.6 mg of Copper, 9.7 mg of Iron, 31.16 g of Total Fat, 543 mg of Phosphorus, 265 mg of Magnesium, 570 mg of Calcium and 6.23 mg of Zinc. Methicillin-resistant Staphylococcus aureus or MRSA is a type of often-fatal infection which is hard to treat. Researchers at the University of Health Sciences in Lahore in Pakistan discovered that patients suffering from MRSA responded well to black cumin seed treatment. 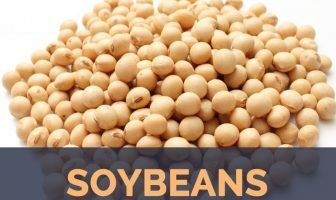 The seeds consist of powerful anti-microbial and anti-bacterial agents which kill bacteria on contact. All without unwanted side effects. Health experts consider that black cumin seeds have the capability to treat other strains of bacteria that are resistant to antibiotics including microbes that cause HIV, staphylococcal, malaria, tuberculosis, influenza, candida, and Gonorrhea. As we all know that black cumin is an excellent source of iron and calcium thus extremely beneficial for lactating mothers, pregnant women and menstruating women due to their high need for iron and calcium. Additionally cumin also boosts breast milk secretion in newborn women because of its high constituent of thymol that increases mammary glands secretions. It is preferably taken together with honey. According to a report published in the Medical Science Monitor journal, regular consumption of black cumin seeds help to minimize seizure attacks in epileptic children. The research involved monitoring epileptic children who no longer respond to conventional treatment. Researchers conclude that the seeds contain anticonvulsive agents that impressively reduce epileptic seizures. 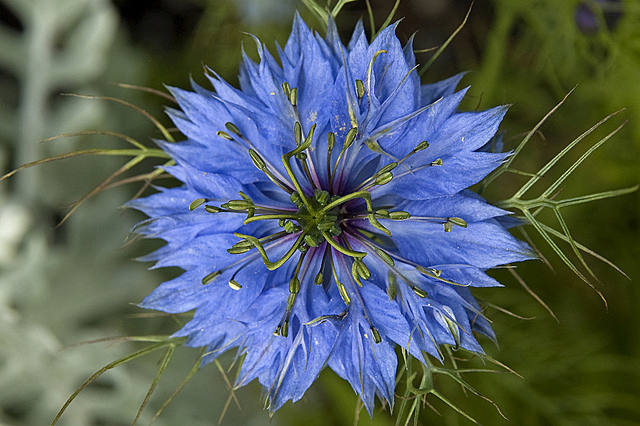 Nigella Sativa seeds are carminative, meaning they support in digestion. Black Cumin seeds offer some digestive benefits because of their calcium and copper content. Copper found in cumin seeds also maintains the health of digestive system. A 2-tablespoon serving of cumin seeds contains 112 milligrams of calcium and 104 micrograms of copper — 11 percent of your daily calcium and 12 percent of your daily copper needs. So include black cumin in your regular diet to solve all the digestion related problems. 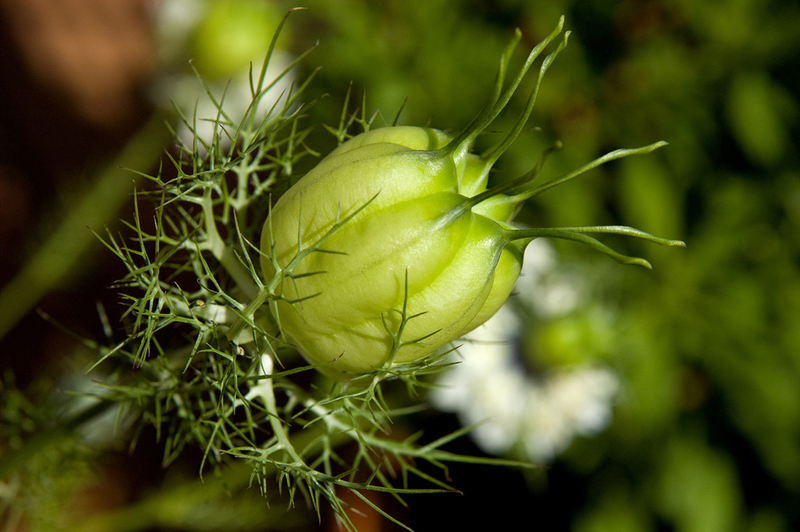 Nigella sativa seeds are used as a spice to flavor buns, breads and pastries, sauces and beverages. It is used mostly in candies, curries and liquors. Nigella is used in Armenian string cheese called Majdouleh or Majdouli in Middle East. Egyptians spread the seeds on bread or put them on cakes like com fits. Nigella is commonly used to flavor pastries in Bosnia. Peshawari naan bread is topped with nigella seeds. Kalonji is one the five ingredients in the spice blend called panch phoron, widely used in eastern India and Bangladesh particularly in Mithilia, Bengali, Assamese and Oriya cuisine. 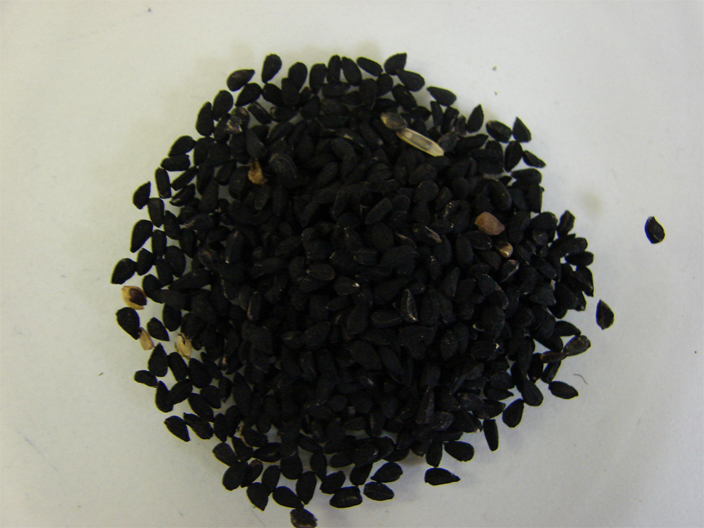 Seeds of Nigella sativa are used as a spice in Indian and Middle Eastern cuisines. Dry-roasted nigella seeds are used to flavor curries, vegetables and pulses. Black cumin, is used as herbal folk medicine all over the world for the treatment and prevention of a number of diseases like asthma, dyslipidaemia, bronchitis, diarrhea, diabetes, hyperglycaemia, and related abnormalities headache, cancer, dysentery, infections, obesity, hemorrhoids, hypertension, back pain, hypertension, gastrointestinal problems, sexual diseases eczema, boils, rheumatism, fungal infections, cardiac diseases, and as an abortifacient. People in the Middle East and Southeast Asia have used N. sativa seeds for its homeopathic effects for centuries. Seeds are considered as stimulant, diaphoretic, emenagogue, and are used by nursing mothers to increase milk secretion and as anthlemintic, analgesic and anti-inflammatory agent. Black cumin is also used as a corrigent or adjuvant of purgative and tonic medicines; and as a carminative in indigestion and bowel complaints. sativa oil has also been used to treat skin conditions like eczema, abscesses, and boils and to treat cold symptoms and to fight parasitic infections. Mixture of black cumin, honey and garlic makes a powerful tonic for soothing coughs and boosting immunity, particularly during cold and flu season or if you feel like you’re coming down with an infection. Kalonji seeds are also used in India for putting among linen to keep away insects and also served as insecticides. Black cumin seeds can slow down the process of blood clotting. Hence, it can worsen the bleeding disorders. Therefore, if you are dealing with low blood pressure or any other heart condition, do consult your physician before using them. Black cumin seeds have sedative effects. Therefore, it can increase sleepiness in some people. People with immune disorders should be careful with large doses and should be under the care of a professional when using larger doses. Black seed can lower blood sugar levels and if you are using other products that do the same you should be careful. Since black seed can lower hypertension (higher blood pressure), you should be careful if your doctor has you on blood pressure medicines.